The venerated colors of purple and gold, normally reserved for the star-studded walks of Hollywood, captivated the walls of Robertson Gymnasium for one memorable week. 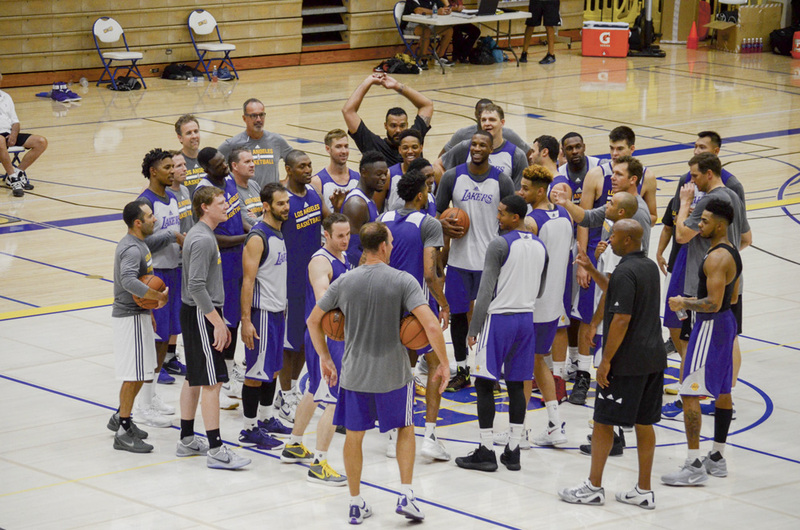 The Los Angeles Lakers journeyed to the University of California, Santa Barbara, for the franchise’s annual training camp between Sep. 27 and Oct. 2. The team participated in two-a-day practices for most of the week-long camp. The coaches ran the players through drills and scrimmages to prepare the team for the upcoming preseason, which the Lakers will kick off on Oct. 9 in Ontario, Calif. In typical training camp fashion, the week also featured some moments of team-building meant to allow the players to build chemistry with each other. Each day of the camp, handfuls of excited UCSB students gathered around the entrance to Rob. Gym in order to get some attention, in autograph or photograph form, from the players and coaches leaving for the afternoon. The first few days of the camp were strictly basketball-related. At the end of Day 2, starting center Timofey Mozgov shared what he had seen so far in Santa Barbara. “I see bus, I see my room and I see my dinner room,” the Russian star said with a laugh. Later on in the week, the players said, they got to see a little more than just the confines of Rob. Gym and their hotel. In fact, the team took a trip to Zodo’s Bowling & Beyond in Goleta on Saturday for a game of bowling. Head Coach Luke Walton said the outing was a nice way to “get out of the hotel and off the practice floor,” though his squad of coaches ended up losing to some of the players. Though a drive from Los Angeles to Santa Barbara takes close to two hours in regular daytime traffic, the Lakers are no strangers to UCSB. Associate Head Coach Brian Shaw is a staple of the university’s basketball history. Transferring from St. Mary’s College of California after his sophomore year, Shaw played two seasons for UCSB between 1986 and 1988. In his senior season, he led the Gauchos to a record 22-win season and the program’s first ever berth in the National Collegiate Athletic Association Men’s Division I Basketball Tournament. He is currently listed in the UCSB Athletics Department Hall of Fame. Following his college career, Shaw went on to play 14 seasons in the National Basketball Association, winning three NBA championships in his final four seasons as a member of the Lakers. After a string of coaching stints that included a head-coaching gig with the Denver Nuggets, he was hired as associate head coach in May. Now, Shaw is back in L.A., and by consequence, back in Santa Barbara. When asked about his favorite memory at UCSB, Shaw recounted his biggest victories on the basketball court. The Gauchos defeated the University of Nevada, Las Vegas men’s basketball team in Jan. 1988, ending the Rebels’ 22-game winning streak. It was one of the team’s two wins over UNLV that year. The same season, the Gauchos beat North Carolina State University, ranked number eight in the nation at the time. In the years since, the men’s team has not encountered much of the same success as the Brian Shaw-led ‘88 season. While more NBA talent has since come through the program, the team has reached the national tournament just four times in the 28 years since Shaw’s departure. But Shaw himself feels the program has some advantages against the other, more talented teams in the country. “Most of the players that come here are going to be four-year players,” Shaw said. He alluded to more prestigious Division I teams, whose best players are often too talented to stay for more than one or two years before jumping to the professional level. “A team like UCSB that has juniors and seniors who have been here for a while can gel and really push the envelope against those more talented schools,” he said. Lakers’ General Manager Mitch Kupchak, considered one of the greatest general managers in basketball history, also holds strong ties to the university. Kupchak’s son, Maxwell, is currently a Gaucho himself and a member of the men’s basketball team. Father Mitch talked about coming to see his son play during the upcoming 2016-17 NCAA season, which UCSB will begin on Nov. 12. Since the Gauchos play in the Big West Conference, Kupchak said, he will be able to catch Maxwell in action when the team visits schools closer to Los Angeles, like the University of California, Irvine, and the California State Universities, Fullerton and Northridge. As far as watching his son in games at the Thunderdome, Kupchak said he will make it to “five or six” games this upcoming season. One final piece of history between the team and UCSB is athletic trainer Nina Hsieh, who has served as the head athletic trainer for the Lakers’ Development League affiliate, the Los Angeles D-Fenders, since 2008. Previously, she worked as an athletic trainer at UCSB from 2004 to 2008. During her time with the Gauchos, she worked with the women’s basketball and men’s soccer teams. Hsieh was called up to the Lakers’ official team as an assistant athletic trainer for the duration of the training camp. Coming up to Santa Barbara was a “cool way to get away from L.A.” and bond with the team, said Jordan Clarkson on the final day of training camp. He and teammates D’Angelo Russell, Brandon Ingram and Anthony Brown took a trip to Albertson’s in Goleta late Saturday night to grab some snacks.